Paul Bocuse was born on Feb. 11, 1926, in Collonges-au-Mont-d’Or, where his forebears had been cooking and serving food for seven generations. At the age of 8, he made his first serious dish, veal kidneys with puréed potatoes, and as a teenager he began an apprenticeship at a local restaurant. The training was interrupted by World War II, however, when he was assigned to a Vichy government youth camp and put to work in its canteen and slaughterhouse. In 1944, he joined the 1st Free French Division and was wounded in combat in Alsace. He received the Croix de Guerre. After the war, he resumed his apprenticeship at the restaurant, La Mère Brazier in Le Col de la Luère, outside Lyon. Like its twin in Lyon, it was owned by the legendary Eugénie Brazier and had achieved three Michelin stars by serving impeccable renditions of regional classics. In 1956, Mr. Bocuse returned to the family restaurant, the Auberge du Pont de Collonges, which earned its first Michelin star two years later. Despite the paper tablecloths and stainless-steel cutlery, a second star was awarded in 1960. President Valéry Giscard d’Estaing awarded Mr. Bocuse with the French Legion of Honor in Paris in 1975. In 1966, a year after the restaurant earned its third star, Mr. Bocuse bought back the old family restaurant that his grandfather, in straitened circumstances, had sold in 1921 along with the rights to the Bocuse name. He renamed the building, which once belonged to an order of monks, the Abbaye de Collonges and converted it into a banquet hall. He also hoisted a four-foot neon “Paul Bocuse” sign atop his restaurant. The groundswell for nouvelle cuisine transformed Mr. Bocuse into the international face of French cooking. He appeared on the cover of The New York Times Magazine in 1972. In 1975, resplendent in chef whites and toque, he looked out from the cover of Newsweek under the banner headline “Food: The New Wave.” An apprenticeship at his restaurant became a rite of passage for ambitious chefs, including Jean-Georges Vongerichten and Daniel Boulud. Nouvelle cuisine lost momentum, but Mr. Bocuse did not. In the early 1980s, the Walt Disney Company invited him to create restaurants for the French pavilion at Epcot Center (now Walt Disney World) in Orlando, Fla. With Gaston Lenôtre and Roger Vergé, he developed Les Chefs de France restaurant, which is now operated by his son, Jérôme, a graduate of the Culinary Institute of America. It serves 2,000 meals a day and generates about $30 million a year. When the organizers of Eurexpo, a culinary trade fair in Lyon, approached Mr. Bocuse for ideas on how to promote the event, he proposed a cooking contest in which chefs would prepare two elaborate dishes, one fish and one meat, before a live audience and then submit them to a panel of expert judges for scoring. The Bocuse d’Or, held every two years, made its debut in 1987 and is now regarded as the culinary equivalent of the Olympics, attracting teams from all over the world. A group photo at the 2009 Bocuse d’Or culinary contest included Mr. Bocuse, third from left; Daniel Boulud, fourth from left; and Thomas Keller, third from right. Created by Mr. Bocuse, the competition has become known as the Olympics of Food. In addition to his restaurant in Collonges-au-Mont-d’Or, Mr. Bocuse operated brasseries in France, Switzerland and Japan, and a culinary school at Écully, near Lyon. His cookbooks include “Paul Bocuse’s French Cooking (1977), “Paul Bocuse in Your Kitchen: An Introduction to Classic French Cooking” (1982), “Bocuse à la Carte” (1989) and “Paul Bocuse: The Complete Recipes” (2011). For many years, Mr. Bocuse resisted writing the story of his life, but he eventually worked with Eve-Marie Zizza-Lalu to produce an as-told-to memoir, “Paul Bocuse: The Sacred Fire,” published in 2005. Even in France, eyebrows lifted a little when Mr. Bocuse revealed that for more than 30 years, he had enjoyed the company of not only his wife, Raymonde, the mother of his daughter, Françoise Bernachon, but also of two mistresses, one of them the mother of Jérôme. His wife survives him, as do his two children. 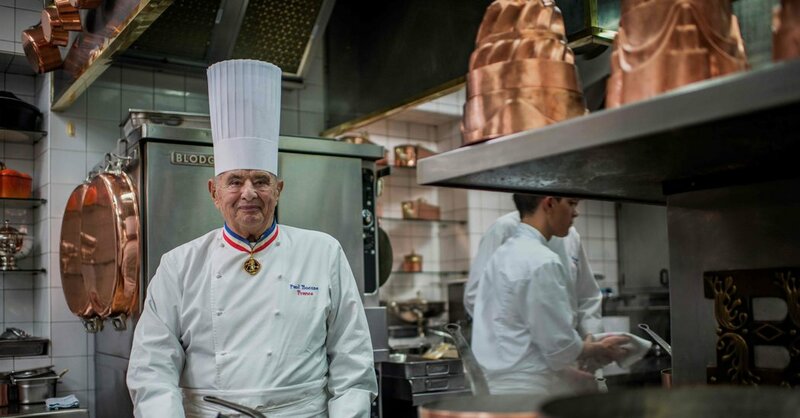 Despite his international status, Mr. Bocuse remained a chef deeply rooted in his native soil. He loved the traditional dishes of Lyon. He slept in the same bedroom where he had been born.